A Designated Linklater Voice Teacher since 1998, Patricia completed extensive training with world-renowned Kristin Linklater in her process for ‘freeing the natural voice’. 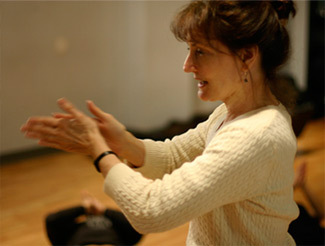 Patricia utilizes the techniques of this clear vocal progression, which seamlessly connects language with breath and voice, in all aspects of her coaching and teaching. She can help actors find their own clear, natural speaking voice, speak on an open-throated release of breath, eliminate vocal ‘fry’, ‘glottal attack’ and nasality, express themselves with a full range of inflection and vocal color, embody the voice/speech choices of the character, and prepare for any on-camera/TV/theatre role.